A local Act of 1764 "for the better Relief and Employment of the Poor in the Hundred of Wangford, Suffolk" established the Wangford Hundred incorporation, which comprised 27 parishes. In 1766-7, the incorporation built a workhouse at Shipmeadow on 44 acres of farm land bought from from Thomas Farr for £784. The specification of the building was for 350 inmates, including 29 rooms for married couples, a dormitory for boys and single men, a dormitory for girls and single women, large work rooms, an infirmary with two wards for the elderly, a school room, a Guardians' committee room, a kitchen, a laundry, a granary, a linenhouse, various out-houses, two arcades 50 feet by 20 feet "with Bogg Houses at the end of each", and quarters for the Governor. Construction of the building, an H-shaped red-brick structure two-storeys high with attics, cost around £4,000. The bricks cost 12s. per 1000 for "plain" and 15s. per 1000 for "stock" bricks. The east and west fronts were each 100 feet in length, and the north and south wings were each 210 feet, each part being 20 feet in breadth. The ground floor was 10 feet 2 inches high, consisting mostly of offices. The first floor was 9 feet 4 inches high, mostly store rooms and committee rooms. The second floor was 10 feet high and was chiefly lodging rooms, including 20 separate rooms for married couples, each 9 feet 9 inches by 8 feet 10 inches. The able-bodied women, most admitted because of bastardy, were employed in washing, nursing, spinning wool and tow, and taking care of the children. They were also occasionally let out to farmers in the neighbourhood. Children were employed in spinning and taught to read within the workhouse by suitably qualified persons. Income from the labour of the poor amounted to £163-3-11 in 1774. The officers employed in the workhouse were the chaplain (paid only £5 per annum as the house was near the church and the poor attended there), two surgeons for medicines and attendance (£80), treasurer (no salary), governor (only £30 as his own children were lodged and educated in the house), clerk (£25), clerk of the peace (for auditing the accounts for passing by the Quarter Sessions, £2.2s). The workhouse purchased a 40-acre farm and erected a barn cowhouse and stable. A pesthouse was also built 300 yards from the house. It was a two-storey building with attics, and used as an isolation hospital for up to 30 infectious patients, mostly with smallpox, including cases from the local neighbourhood. In 1767, 85 inmates received inoculation against smallpox. Other conditions suffered by inmates included venereal diseases and rheumatism. County of Suffolk: Barsham, Beccles (6), Bungay—Holy Trinity (4), Bungay—St Mary (4), North Cove, South Elmham—All Saints and St Nicholas (2), South Elmham—St Cross or Sandcroft (2), South Elmham—St James (2), South Elmham—St Margaret, South Elmham—St Michael, South Elmham—St Nicholas, South Elmham—St Peter, Ellough, Flixton (2), Homersfield, Ilkesthall—St Andrew (2), Ilkesthall—St John, Ilkesthall—St Margaret (2), Redisham, Ringsfield 92), Shadingfield, Shipmeadow, Sotterley, Weston, Willingham, Worlingham. The population falling within the new Union at the 1831 census had been 13,058 with parishes ranging in size from Ilkesthall St John (population 72) to Beccles (3,862). The average annual poor-rate expenditure for the period 1831-34 had been £11,298 or 17s.4d per head of the population. The Incorporation workhouse was taken over by the new Wangford Union. Its location and layout are shown on the 1903 OS map. 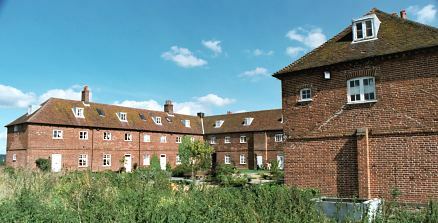 Wangford workhouse from the west, 2001. Wangford workhouse from the south-west, 2001. Wangford chapel and outbuildings from the north-west, 2001. 0n the 3rd September 1939, 400 boys and staff of The Gravesend County School for Boys (now the Grammar School), were evacuated on the MV Royal Daffodil from Gravesend, Kent, to Lowestoft and were eventually were billeted in Beccles. A search for a building for use as a school with the boys and staff under one roof showed that the only one available was Shipmeadow House. This was, at the time, being used to store ARP equipment for the area. The House was renovated and school furniture and equipment brought up from Gravesend in the autumn of 1939 and schooling began on the 1st January 1940. In the following May, Beccles was brought within a new defence area against the possibility of a German invasion and all evacuees were ordered to move, possibly to the Midlands or to South Wales. However permission was given for the boys and staff to move to Bungay so that they could continue to use Shipmeadow House as a school. The school continued until the summer of 1942. After exams, a number of the boys left school and teachers were needed at the school in Gravesend so the whole school went home to Kent. I believe the House then became a chicken farm. I was one of the evacuees - we were the lucky ones. Three years in the lovely Suffolk countryside. The generosity and kindness of the local people will be remembered always. We became quite fond of the old House and can always say that went to school in a workhouse! The was later used as a pig-farm, but the buildings have now been converted to residential use. By the 1920s, the Wangford Union had established a children's home on Upper Olland Street, Bungay. It could house up to 20 children. The union is also believed to have operated a children's home pn Ravensmere (or Ravensmeer) at Beccles. Suffolk Record Office, Central Library, Clapham Road, Lowestoft NR32 1DR. Extensive holdings include: Minute books (1764-1930); Births (1848-1946); Baptisms (1813-1943); Deaths (1848-1946); Burials (1899-1930); Register of married couples (1914-39); Register of lunatics (1889-1918); Register of mechanical restraint (1892-1916); Creed registers (1893-1945); Register of persons receiving infants for reward (1909-29); Admissions and discharges (1915-45); Ledgers (1794-1930); Master's journals (1913-31); etc. Abstract of the Returns from the Governors, Directors etc. of the Several Houses of Industry, and Workhouses, Specially Established for the Relief and Employment of the Poor (1776).